The Magazine Blueprint is a how-to guide to creating your own independent magazine. From idea to execution and everything in between, the book will show you how to get your independent magazine to market. 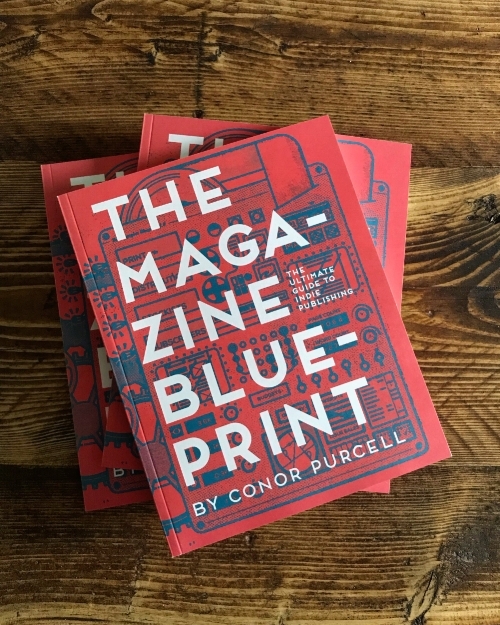 Featuring interviews with publishers, editors, designers and retailers around the world, The Magazine Blueprint is the most comprehensive guide to magazine making on the market. Sign up below to get information on the first issue plus bonus PDFs. This is crucial. Too many publishers wait until their magazine has gone to press before they start promoting it. This is far too late. Promotion needs to start before you start compiling your first issue. Once you have figured out your title, buy a URL and set up a website. Start collecting the names and email addresses of interested people to build up a mailing list, which you can mail once the first issue is ready to order. Then, set up your social media channels and start posting. This will alert the world that you exist and give you a chance to tweak your voice. If you do this six months before you launch, you should have an audience to sell to. No one needs another soft-focus magazine featuring fawning interviews with graphic designers or coffee shop owners. While interviews such as these are easy to do, they result in boring, insipid content, and if the reader is bored, you probably will be too. What do you want to say? What angers you? What inspires you? What stories do you want to tell? Not every article has to be a call to arms, but you should have a view about whatever you are focusing on. Be bold, be creative, be contrary — it’s your magazine and you should take risks when choosing what goes in it. This is vital. If you don’t enjoy the process of making a magazine, then you will give up. The chance of getting rich from your independent magazine is almost zero. The chances of making a profit are much greater, but this takes time and dedication. If you are not in it for the long haul, then you will give up. There will be setbacks, frustrations and days when you wish you had never started. Take these in your stride and focus on the big picture. There are few better feelings then holding a freshly-printed copy of your magazine in your hands. One of the great strengths every indie publisher has is their size; while the bigger magazines are often slow moving, you can move quickly. Whether that means tweaking your content or masthead, setting up a new social media channel or setting up a mailing list, you can do it without asking anyone for permission. Just be clear that what you are doing makes sense for your brand. It’s true — while you might believe your magazine is the best thing ever created, most people won’t care. It’s your job to make them care — through marketing and through creating a compelling product. Be different, take risks and great things just might happen.